The population of South Island lesser short-tailed bats in the Eglinton Valley is the only known viable population of this species on mainland South Island. Invasive animal pests such as stoats, cats, rats and possums are controlled to protect a range of threatened native species present in the valley. The Eglinton Valley is one of the only sites in the South Island with both species of bats: long-tailed bats and lesser short-tailed bats. during winter when they may remain inactive (in torpor) within roosts. A continuous stoat control and periodic rat and possum control programme is in place in the valley to protect these species. Aerial 1080 operations were conducted over in the Eglinton Valley in 2014 and 2016 in response to rat plague events. This provided an opportunity to measure the effects of an aerial 1080 operation on a well-marked short-tailed bat population. This programme estimates lesser short-tailed bat survival and population size in the Eglinton Valley from year to year, and so assesses the effectiveness of predator control in the valley. 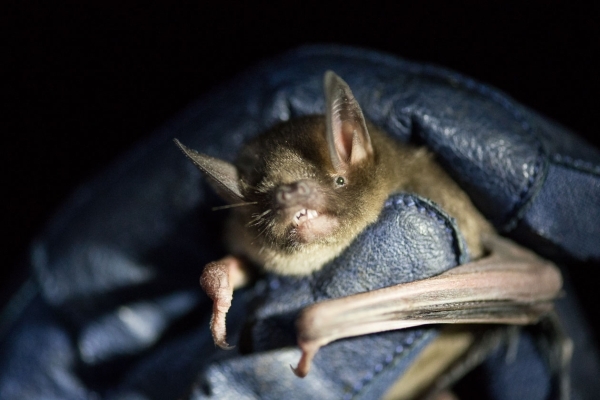 The aim is to ensure the long-term security of the short-tailed bat population. It is a long-term project and compliments other monitoring in the valley, resulting in a unique project with one of the longest histories and the broadest scope in the country. Informal monitoring began in 1997 when lesser short-tailed bats were discovered in the Eglinton Valley for the first time. There have been a range of monitoring methods since then. Infra-red video-cameras were used initially to record bats as they exited their roost trees at night. Video-monitoring of roost emergence is a useful monitoring tool. However it under-estimates of the lesser short-tailed bat population as they often emerge from several holes in a roost tree and frequently move roost sites.This is now a secondary monitoring method. Mark-recapture analysis individually identifies animals in order to calculate estimates of population size and survival. Forearm banding with uniquely numbered metal bands was used. However it caused damage to the bats and there was an urgent need to develop alternative marking techniques. Passive integrated transponder tags (PIT-tags, transponders or micro-chips) is pioneering technique suitable for marking and monitoring population trends in lesser short-tailed bats in the Eglinton Valley. This is now the primary monitoring method. Proportion of PIT-tagged (individually marked) bats alive immediately before, during and following the poison operation. Analyse data using mark-recapture data to gain survival estimates before the poison operation (November, early December), 1 week after (December) and in January/February using Program Mark. Proportion of bats caught at dawn at roosts or on foraging grounds displaying symptoms of poisoning. Number of dead bats found at roost sites. Long-tailed bats in the Eglinton valley are increasing slowly following sustained trapping and a number of aerial 1080 and pindone operations in bait stations aimed at controlling rats. Because both species of bats only produce one pup a year, recovery will be slow and requires a long-term commitment. Reports outlining monitoring results, show the population trends and make recommendations for further monitoring of this bat population. Annual reports summarising the animal pest control and monitoring carried out in the Eglinton Valley. Invasive animal pests are controlled to protect a range of threatened native species present in the valley. The endangered lesser short-tailed bat is an ancient species unique to New Zealand and is found only in a few locations. The greater short-tailed bat is probably extinct. Every January a select band of DOC staff head to the Eglinton Valley in Fiordland to measure the populations of our rare native bats.